or call 08456 38 37 73. Allamanda is one of six privately owned villas built around an exclusive fresh-water pool, directly on Emerald Beach Gibb's Bay on the West Coast of Barbados, between Holetown and Speightstown. Two of the three bedrooms are on the second floor; each of the very private bedrooms has generous closets, a full bathroom ensuite, a balcony overlooking the pool and spectacular views of the Caribbean sea. The covered patio overlooking the pool and the sea is furnished to comfortably seat six people lounging, with two additional seats for dining. 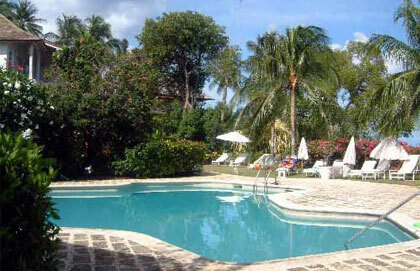 Additional lounge chairs are provided on the lawn near the pool for six persons. The beach, said to be one of the finest in Barbados benefits from the calmer Caribbean waters, is very private and provides excellent swimming facilities as well as other water sports activity such as scuba, diving, windsurfing, sail boating. Diving is especially very good with the many shallow west coast reefs. Allamanda’s tranquil and scenic setting along with the facilities provided creates and independent retreat. The villa, however is conveniently located for Sandy Lane golf course – 3 miles, Speighstown shopping centre – 1 mile and the Airport which is 18 miles away. Please contact us to book this villa in Barbados.